On 1 June 1968, William J Meister Sr (1904-1987), an amateur fossil hunter from Kearns (Utah, USA) arrived for a holiday in Antelope Springs, about 69 km (43 miles) north-west of Delta (Utah, USA). On their third day there, Meister and his family went out searching for trilobite fossils. One fossil stood out, as it was not simply a trilobite. It was formed in Middle Cambrian Wheeler Shale, dated to 505 to 590 million years ago. 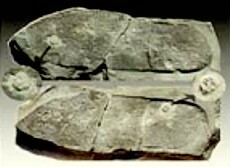 It contained the impression of what resembled the sole of a shoe, about 260 mm (10¼ inches) long, 89 mm (3½ inches) wide at its widest point and 76 mm (3 inches) wide at the ‘heel’, which was depressed 3 mm (⅛ inch) further than the rest of the imprint. Beneath the print were the fossils of two trilobites and Meister thought that this showed that the wearer of the ‘sandals’ had trodden on them, squashing them into the mud on which he (or she) had been walking. On returning home, he showed the fossil to Melvin A Cook (1911-1989), president of a chemical company in West Jordan (Utah, USA), who urged him to go back to the site to search for more evidence, so in July, he returned to the site with two geologists, Clarence Coombs (c 1910-2004) of Columbia Union College, Tacoma (Maryland, USA), and Maurice Carlisle, who had qualified at the University of Colorado, Boulder (Colorado, USA). They found slabs of mudstone that they concluded had once formed a land surface on which creatures could have walked. A few weeks later, Clifford Burdick (1894-1992), a geologist and creationist from Tucson (Arizona, USA), discovered what appeared to be footprints of a human child nearby, when he accompanied Maurice Carlisle to the site around 20 July. This time the foot seemed naked. Although an (unnamed) palaeontologist dismissed the find as not of animal origin – meaning that it was not a print of any creature, human or otherwise – Burdick continued to believe in its human origin. In August, Dean Bitter, a teacher from Salt Lake City (Utah, USA), discovered two more sandal prints. There are the usual problems: whilst there are undoubted resemblances between the shape of the print and that of a shoe sole, part of the imprint is missing. Furthermore, if the imprint really is of a shoe worn by a (presumably air-breathing) human, we have to explain the presence of trilobites, a marine creature. This would have to be not the footprint of a shoe-wearing being walking along a shallow stream, but of one walking on the seabed. Worse, there is no trace of pressure exerted by the supposed wearer of the shoe upon the trilobite (despite the alleged compaction of the sand grains) and the supposed heel is formed by a crack that runs across the whole slab, continuing beyond the ‘footprint’. Similar patterns have been found throughout the Wheeler formation, while concentric oval shapes of varying colour, sometimes with a stepped profile, are what were interpreted by Burdick and Bitter as in situ footprints or sandal prints. Moreover, it is telling that Meister and Bitter’s discoveries were announced in The Creation Research Society Quarterly by Melvin A Cook, while Burdick’s appeared in The Bible-Science Newsletter of August/September 1969: Clifford Burdick was not simply a geologist, but a well known creationist whose work aimed at demonstrating a young earth. We thus see a polarisation of opinion: creationists on the one hand identifying the ‘prints’ as having been made by humans and geologists and palaeontologists, on the other, identifying them as natural. The mystery is not how human footprints came to be left in a shale that formed many millions of years ago but how people are prepared to dismiss expert opinions that do not match their religious preconceptions. A detailed examination of the find can be found on the TalkOrigins website. Just curious, if there was the sea or water present, wouldn’t it be easily explained if he was walking in a shallow inlet from the sea, or just walking along a beach with low tide, where you find seashells and the like? Were trilobites edible/fishing by any chance for any reason? Can you tell if the trilobite had been sitting there dead for a long time? Also, there have to be like a zillion reasons that an imprint might not have been fully impressed. And yes, of course creationists and evolutions might have differing subjective opinions on this. Another source I read also says William J Meister was a non-creationist, until this particular discovery. What, it’s telling that evidence that could support creationism was reported by a creationist in a creationist newsletter? The scoundrel! And um, if Burdick was a geologist, doesn’t that make him an expert? Why are we dismissing his opinion? Just saying, it’d be really nice if I could read just a single account that wasn’t coloured by personal opinions of evolutionists/naturalists or creationists. Just the facts please, interpretations separate. Seriously, I’ll be super impressed the day someone is secure enough to calmly provide rationale for these different perspectives and allow the reader to use intelligence and discernment in which he finds more credible. That way, no one can accuse you of false bias. That said, the thing about pressure and the crack is interesting. I’ll have to remember that. I have walked allot on the beach, and muddy surfaces where little critters are present. I have stepped on sand crabs and sea shells in the sand and muddy surfaces. they don’t always get completely smashed. its quite possible to step on one and it just gets squished into the substrate, injuring it but not squishing it enough to crack its shell all over. This author has a problem with trying to explain how the trilobite got there if it is a sandal print, and it sure looks like a sandal print. Just as in the dinosaur prints with human prints, and trinkets and carvings, and artwork depicting ancient humans interacting with dinosaurs, and those depictions are quite accurate, Evolutionists tend to dismiss them by saying “must be false, dinosaurs were dead for millions of years before people evolved.” They are letting the acceptance of a weak theory invalidate any opposing evidence. Its not the sandle prints thats out of place, or the trilobite. If there are sandle prints on trilobites, than its their theory evolution and timescales that is out of place. But just look at all the problems with this supposed “print”. Why does the crack interpreted as the “heel” extend beyond the edges of the “footprint”? Real prints in sand or mud don’t do that. The trilobite is of the species Elrathia kingi (most creationist websites give the wrong name and cite it as Erathia kingi), one of the most common species found in North America; they were the earliest trilobite species to colonise oxygen poor (in other words, deep sea) environments and did not live near sea shores, where there is too much oxygen. This makes your ”just-so story” of walking merrily along the beach, squishing things into the sand just a picturesque tale with no bearing on this “footprint”. The animals lived at a depth for too great for someone to tread on them! …or was the trilobite right where it was supposed to be, at the bottom of a sea ? Perhaps dead and under a layer of mud…and the sea receded (we know that parts, at least, of the North American continent were once an ocean). And along comes somebody at a much later date, wading through the mud that was once a seabed, and steps directly on a preserved and ancient creature. It is neither impossible nor implausible. It’s possible, I suppose, but implausible given the lack of evidence that this really is a footprint. It is my impression that you are making the argument that because this particular species lived in deep sea low-oxygen environments, it is not possible one could have been troddened upon on shore. This would assume that when one of these creatures happened to die they just sank to the bottom of the deep sea never to be seen again? Why is this particular species showing up all over Utah…. “(Elrathia kingi) is one of the most common trilobite fossils in the USA locally found in extremely high concentrations within the Wheeler Formation in the U.S. state of Utah”. Note the “extremely high concentrations” part ─ these things were probably littered all over the ‘Meister Man’s’ shore. If you have ever walked in the sand with shoes on you would understand how your heel marks leave a wide margin for cracks and imperfections under normal circumstances, and without stepping on a hard, sand-blown, surface object. This occurrs within an hour of mild shore winds let alone who knows the conditions and potential attrition of 200+ million years. Nobody is making the claim the creature was stepped on while it was alive. How would a dead sea creature, living at the bottom of the ocean, wind up on the seashore? If that could happen, we’d always be seeing many of the strange creatures that live in the deep sea, on our seashores, but we don’t. I think people commenting here have missed the main point: The only place where the trilobite fossils could be found are places where there are water currents (inlet, ocean, beach, etc). Water currents erode foot-prints. This was formed by something resting on the surface for a prolonged period of time. Since when do primitive (or any) sandals have heels? We can all see faces in clouds. it strikes me that this is what is going on here. just the well documented (in medical and related research) habit we humans have in seeing something familiar in strange objects. I studied a bit of paleontology at graduation, I’m curious to know how anyone can say that this trilobite species inhabited only environments of great depth, low oxygen etc … this “great” achievement for a science that in 90% of the time is not even sure about whether a fossil is of one species or another. Keith, please, as you foward the argument, you could indicate the publication of this information, just to know if there is a rigorous study on this matter or if it is one of those overestimated scientific statements based on pure speculation (and never adressed by some “Bad Paleontology” debunkers). I can’t understand how people are ignoring the obvious answer for this conundrum. I think it’s pretty apparent that someone happened upon fossils created by time travelers from the future. There is no evidence that humans existed, much less had sandals, at this point in time in history, but you cannot deny that those look incredibly like footprints created by some sort of shoe. The evidence of humanoid creatures first appeared somewhere around 2.8 million years ago, and they did not wear shoes. 2.8 million years to 500 million years is quite a stretch of an evolutionary time frame, with or without the shoes. Therefore, it seems highly unlikely that a rare fossil such as this would appear once in a lifetime if humanoids were indeed prevalent on the Earth during that time frame. There should be many (not to mention more convincing) fossils with at least some evidence pointing towards this development. That being said, the unlikelihood of this being a human created fossil does not rule out the possibility, regardless of whether there were humanoids roaming the Earth during this time frame or not. People have mentioned that humans would not have been walking where trilobites would have been, or that the footprints would have been washed away long before a fossil would have been made. Has anyone considered the possibility that perhaps someone from our distant future decided to do some time traveling to explore our prehistoric world, and went deep sea diving specifically to look at prehistoric trilobites? It is possible that if they touched down for a moment to make these sandal like footprints in a sea bed with no running water, footprints may have fossilized. It is also possible that technology they were using could have preserved the footprints even with running water, or even expedited the fossilization process on the spot. It is even possible that a traveler could have made the fossils on purpose, simply to mess with paleontologists from our timeline for their own amusement.